Being chief cook and bottle washer, I try to provide healthy food for the family – lots of fresh produce and vegetables. But when accepted opinion on what is healthy keeps changing, it’s not always easy. I’d just bought a supply of chorizo to make a Jamie Oliver meal when a report came out saying it could be carcinogenic. Here’s what I provided this week. Tuesday night I used aJamie Oliver recipe for chicken with chorizo. 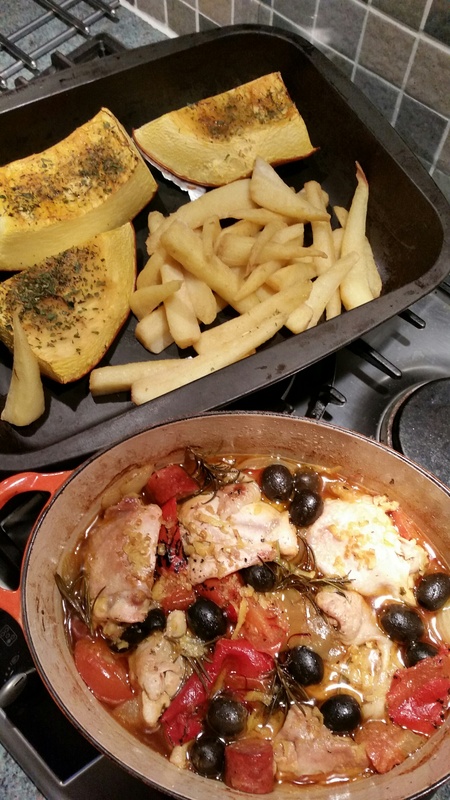 Chicken thighs, roasted pepper, sunflower oil, tomatoes, black olives, onion, garlic, rosemary, lemon peel, chorizo, chicken stock, along with roasted parsnip and roasted pumpkin with herbs. Secret ingredient was a little funghi porcini olive oil to keep the pasta moist. Mostly good ingredients, I think. Only a small portion of chorizo each. 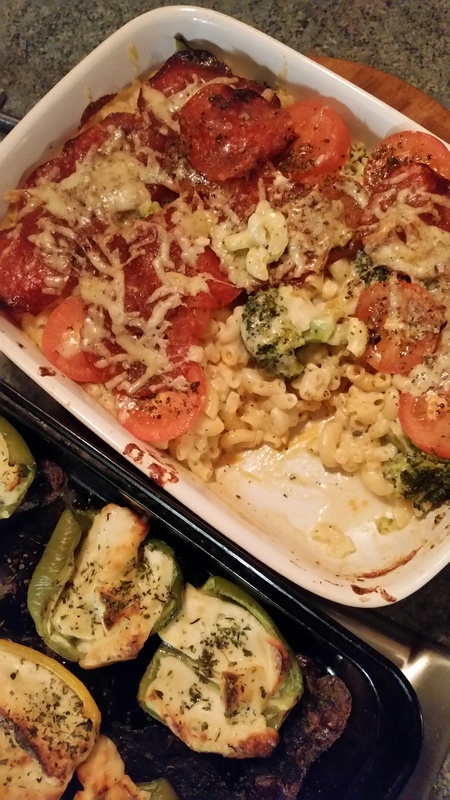 Wednesday was based on a Weightwatcher recipe, with some added ingredients. Boil pasta and broccoli together for a few minutes, empty into baking dish and add cheese sauce (flour, butter, milk, nutmeg), layer with tomatoes and basil, add sliced chorizo de Pamplona, top with grated cheese and bake. Also green peppers with halloumi cheese and mixed herbs. Mostly good, with the sliced chorizo being quite thin – it adds a lot to the taste. Thursday was my own recipe for pork belly, chorizo and black pudding thick goulash. 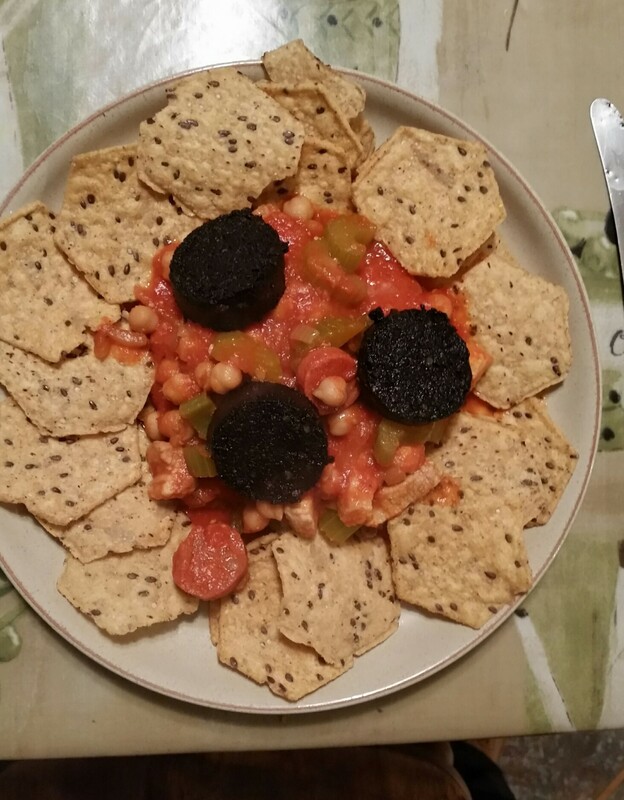 Ingredients were pork belly, chorizo, black pudding, chickpeas, onions, garlic, celery, both picante and dulce pimenton de la vera, multigrain tortilla chips (flax, sesame seed and quinoa). Not shown was pumpkin soup and olive bread. Hmm – some processed meats. Friday was quite healthy, I hope. 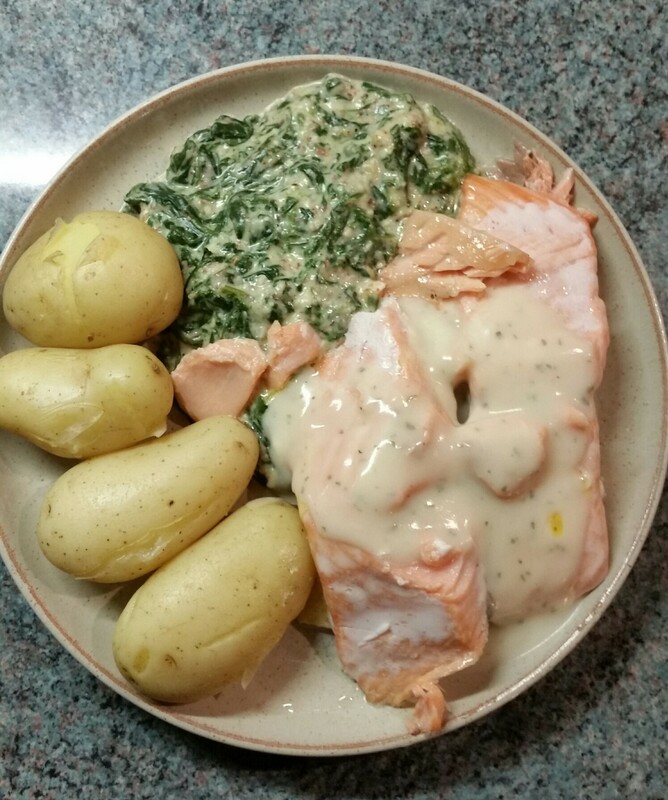 Baked salmon with ndiwo za masamba and new potatoes. Parsley sauce on the salmon. 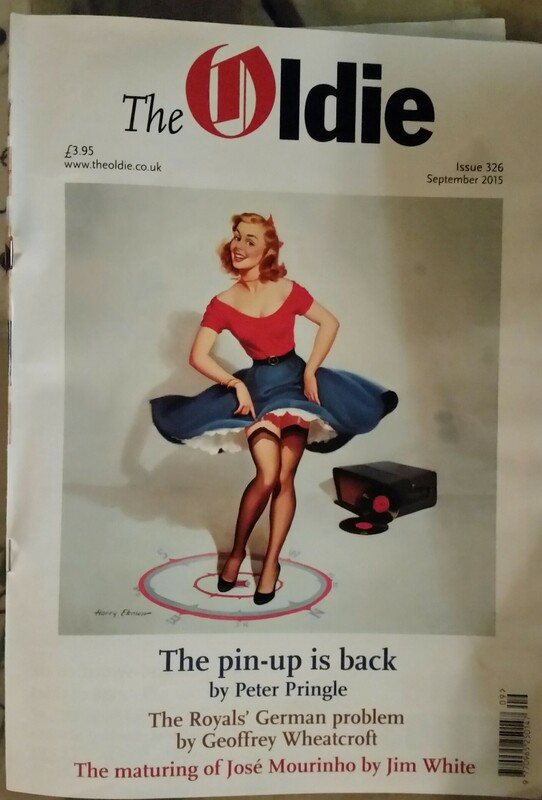 I picked up a free copy of The Oldie (usual price £3.95) at the Edinburgh Book Festival a few weeks ago. It’s essentially a magazine for old people, so I’m going to give it to Fat Mac for him to read in the bath. It has all sorts of items that might interest Fat Mac, but I expect that he’ll turn to the Obituary section first. In the issue I read, there were articles about the Nazis and the Royals, migrants, Georgie Fame and gardening, but I expect his attention will be drawn to the items on life after death, how to mix drinks, and taking a retreat in a Benedictine abbey – all of which are things in which he’s interested. The Ask Mary problem page will also be right up his street. I’ve added the following titles to JournalTOCs, the free current awareness and alerting service for researchers, students and lecturers. JournalTOCs now contains details of the latest Tables of Contents of over 27,000 scholarly journals, including more than 9,400 Open Access journals, and is the largest freely available collection of scholarly journal Tables of Contents. 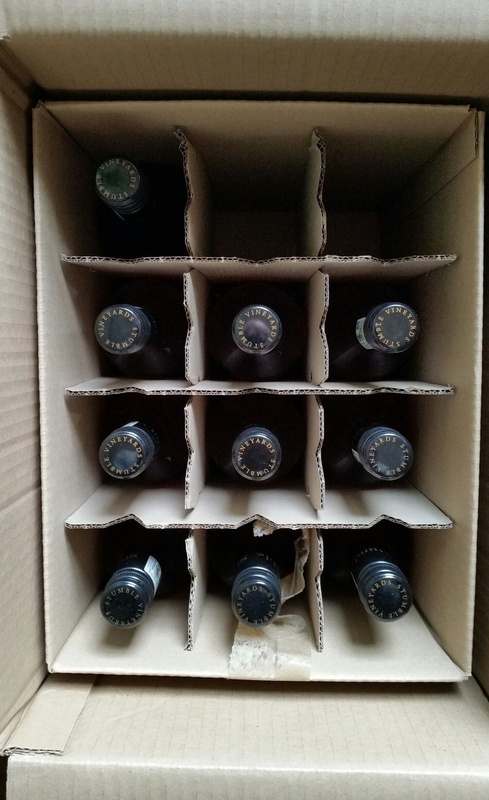 About three times a year a chap from Laithwaites phones me up and after a bit of a discussion to hear about any deals he has, I make an order and wine is delivered to the front door two days later. It’s an efficient process, and from the purchase I get air miles as well. In the past, we’ve ordered Rioja, Pinot Grigio, and various brands from Marlborough in New Zealand. I’ve noticed that some of the reds tend to get left, especially the last batch, Lobo e Falcão from Portugal, which was rather heavy. This time, largely as a result of going on a Cape winelands tour earlier this year, I ordered some Stumble Pinotage Rosé and some Huguenot Chenin Blanc, both from South Africa. Last night I had a glass of the Huguenot, and it was very pleasant. For 6 years I’ve been using a Vaio laptop, which has been getting slower and slower, and one of the keys has actually worn out. It was time to upgrade, but I put things off for several months, waiting for Windows 10, and then simply waiting for inspiration. I was about to order a new laptop when my son Shaun pointed out that he had never seen me actually move the Vaio laptop, so why didn’t I buy a desktop instead, which could be faster, more powerful and possibly cheaper. So I took his advice. In fact, he suggested the kit. 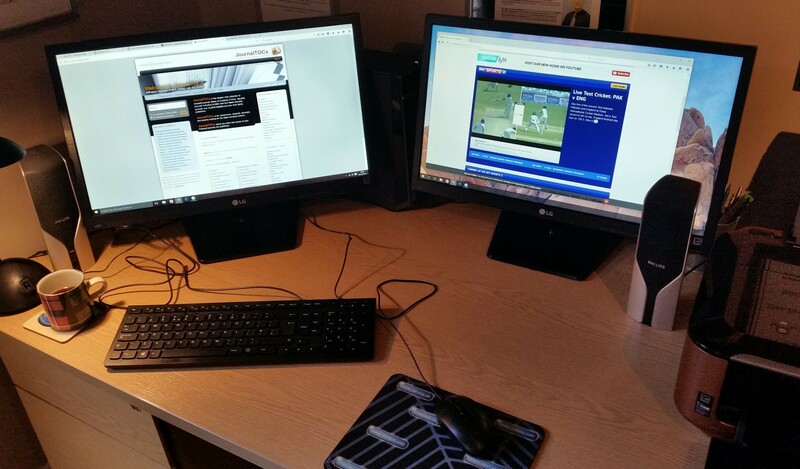 The new kit as shown above has two screens, so that I can watch the cricket on Virgin TV Anywhere on the right screen and do other things, such as work on JournalTOCs, at the same time on the left screen. I also asked Shaun to set everything up, and download Windows 10, which he did, and we thus avoided a lot of cursing on my part. By loading Windows 10 on a new computer we’ve got rid of all the pre-loaded crap that comes with new kit. The only problem so far has been with TV Anywhere and the restrictions that Virgin make on installing it on new devices. They considered the pre-Windows 10 installation on the new desktop as a different device to the post-Windows 10 installation on the same computer, and it took one of their techies to fix things remotely. I have to say that he was very good, but that the Virgin telephone options where you have to press 1 for this and 2 for that in order to eventually get through to a person nearly drove me mad because none of the available options seemed relevant to my question, and it took four attempts. The only other problem is that the Ctrl button on the new keyboard is in a different place to where it is on the laptop, and I press this key hundreds of times each day. The first PC I had at work had, I think, 20 MB of hard disk space and 640kb RAM, and I remember someone telling me that I could type all day, every day, and never fill it up. Now, desktops come with 8 or more GB of RAM alone, plus TBs of disk space. The new high school isn’t the only big development in Portobello. 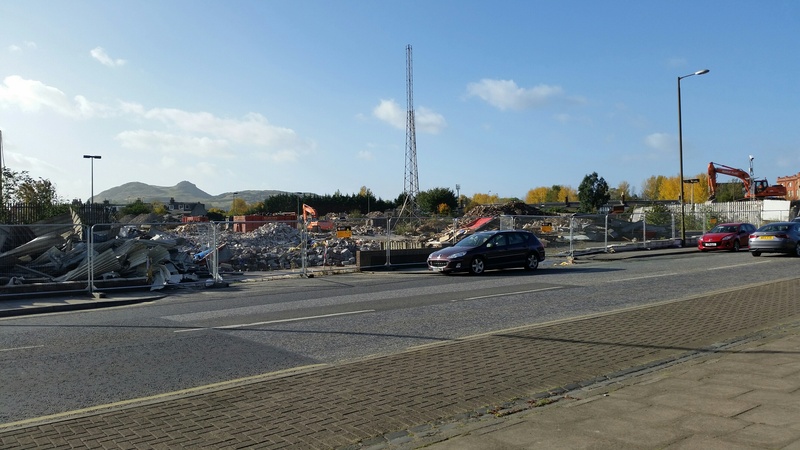 Along the road at Baileyfield, opposite where there was once an outdoor swimming pool, the buildings are being demolished. I believe that over 200 homes and a foodstore are going to be built. I used to read Jisc reports with great interest. Mainly because part of my job depended on what JISC (as it then was, in capital letters) thought and did. Jisc provided many hundreds of thousands, probably over the years millions, of £s in funding for various projects that I managed or was involved with. They have at various times produced numerous reports. I always felt that Jisc reports usually confirmed much of what I, and the other people I worked with, already knew, but that they often didn’t quite ask the right questions at the right time, or make forceful enough recommendations in the light of the evidence presented in the reports, many of which were based on analyses of surveys, and sometimes they didn’t seem to differentiate enough between different disciplines which IMHO worked in quite different ways. At the time, we were all very hesitant to criticise Jisc in any way, because our funding mostly depended on them. Jisc had a life of its own, and trying to figure out its future direction was always difficult. Spotlight on the Digital:Recent trends and research in scholarly discovery behaviour is a new Jisc report, published in 2015 by Dr Ian Chowcat, Sero Consulting. I’ve just checked his Twitter feed – he’s not one of those too-afraid-to-have-an-opinion-better-be-safe-and-totally-politically-correct people. So, that’s a good sign. I started at the end of the ‘Spotlight’ report, in the Reference section, because before reading the rest of it, I want to know who it cites, and I see some familiar names, for example Aaron Tay, who knows a thing or two about resource discovery, and Roger C. Schonfeld, who wrote an excellent paper on access to scholarly resources. So that’s another good sign. I also note somewhere in the text of the report that “…indicates that there is significant variation in user needs and behaviours between disciplines…” Great! The report “…provides an update on the literature relating to the academic library role in discovery for both students and scholars since the earlier literature review published by the Spotlight project in late 2013.” OK, so it is not a report based upon the findings of some survey or other, but rather a survey of various articles. The report’s Executive summary highlights are as much as some people will read, so they are important, and they seem to confirm much of what we all probably already think, but also make good reading. To summarise: online activity is pervasive across all categories of users [yes]; users expect to access resources anywhere from any device [of course]; library tools sit in an eco-system alongside other tools from which users make strategic selections according to purpose [yes]; library staff tend to over-estimate the extent that users use library services [erm..hold on a minute]. Is that correct? Do they over-estimate how much users use library services? I’ll come back to the report’s other highlights shortly. On page 9 evidence is given, from two surveys, which shows that “…in most cases staff over-estimate the extent to which users use different library services, in some cases very greatly.” Well, I can’t argue with the evidence it gives, but I wonder who the library staff in the cited survey were who reckoned that, in order to find a known item, 49% of users would use Copac, SALSER and Suncat. Even the figure of 7% from the users’ survey, seems high to me. The figures for finding a known item through using an abstract database (47% library staff and 29% users) also seem very high, to me. Obviously, most library staff hope that users will often consult the various discovery services made available through libraries at great cost, but hoping that they use, and thinking that they actually use, such tools are two different things. Other highlights from the Executive summary include: some people are challenging the idea that libraries should aim to play a primary role in discovery at all [yes – too little has been done by libraries, too late, IMHO]; libraries should develop services to support specific aspects of discovery in which it can help [yes, this is correct and is very interesting to me]; cede discovery to Google and focus on other activities [almost certainly]; more could be done to ensure seamless access across services, multiple locations and different devices [of course]; more just-in-time information and support could be given [OK]; there is evidence that libraries over-estimate the extent to which users understand library concepts, tools and even basic bibliographic formats and relationships [is that still going on? ]; new library discovery tools can be convenient and flexible, but other services such as Google Scholar still out-perform libraries on factors such as speed of updates, covering non-standard sources, relevancy of results and complementary services such as citations and related articles [yes]. Elsewhere, the report notes: Discussions of what the library should be doing, what are the barriers to its success, and how library services stack up against discovery services provided through other routes, can all be found and shed light on the current discovery behaviour scene. And: Overall, we hope that this review provides a basis for taking on the debate over the library role in discovery and how library services and resources can be best positioned to be found and exploited by users. It also notes a paper about how some researchers are using Twitter to become aware of new literature in their fields, that papers mentioned on Twitter are more downloaded and cited than others, and that chemists are reported as being generally satisfied with the discovery tools they need, though needing more help with keeping up to date and with serendipitous discovery. There are many other interesting findings (e.g. Authentication needs to be as invisible off-campus as it is on-campus [yes please! ]), but I want to concentrate on what the report says about current awareness, keeping up-to-date and serendipity, and also in the light of, as it says, that an increasing proportion of scholarly research is carried out on mobile devices. Plus, and added to those things, the growing importance of Open Access. It notes: The discovery layer is no help with discovery through monitoring for current awareness and the library could possibly do more in this respect, given the fragmentation and incompleteness of current awareness services. Well, this is an example of a Jisc report not being forceful enough in its recommendations. Given that their role in general resource discovery is gradually being ceded by libraries to external services, plus other developments as noted above, libraries should definitely be doing a lot more in an area that they can relatively easily play a role – that of current awareness. And it would not be too difficult for them to do this. I am involved in a current awareness service, called JournalTOCs. It is a free service used by hundreds of thousands of people worldwide. There is also a Premium version of JournalTOCs, aimed at libraries who want a managed current awareness service. Premium is currently being used by a variety of institutions in higher education, plus organisations involved in health, law, pharmaceuticals, etc, and also, thanks to the JEMO Project and INASP, a number of libraries in developing countries such as Ghana, Malawi, Ethiopia, Cuba and Tanzania. For those in Jisc-sponsored UK higher and further education institutions in the UK, there is also Zetoc, a monitoring and search service for global research publications. There is also a commercial journal current awareness service from Third Iron called BrowZine. And there are numerous other alerting services produced by commercial publishers, providing current awareness for their own content – e.g. Taylor & Francis alerts, and SAGE Journals Email Alerts. Each of the above has some unique features, but none is perfect. The services from T&F, Sage and similar only provide alerting for their own titles. BrowZine is mobile based, but includes only a very limited amount of titles unless your institution pays a subscription, and even then you are restricted to titles subscribed to by your institution plus a very limited number of Open Access journals (so there is much that is not included). Access to Zetoc is restricted to Jisc-sponsored UK higher and further education institutions, is web-based and is not, IMHO very user friendly. JournalTOCs, as I have noted, is free (though the Premium version for institutions has a (low) cost), I think it is quite user friendly, but it is web-based. I think it is time that Zetoc and JournalTOCs worked together. In the past, this has not really been possible due to differing funding sources. But how about if Zetoc and JournalTOCs worked together to develop a mobile app – that app would have the same functionality for Zetoc and JournalTOCs users/customers, but would deliver results to each based on the two different data sets behind the services. Or perhaps the JournalTOCs data could be added to Zetoc for Zetoc’s users, but be kept separate for JournalTOCs’ users (Zetoc data cannot be made freely available to all). There’s a fair bit more to this idea than I can explain here, but I reckon with a little effort and not exactly a great deal of funding, researchers everywhere, and potentially libraries everywhere, could use the app and the service to provide an excellent current awareness service of exactly the type recommended by the Chowcat Jisc report. I am hoping to follow up the collaboration idea.